Experience for a period of not less than two years in the maintenance of Air-conditioning and Cold Storage Plant in a reputed firm or a Government Institution. A Diploma in Mechanical Engineering awarded by Department of Technical Education of the Government of Tamil Nadu. Experience for a period of not less than two years in the maintenance of Fuel Gas Plant, in a reputed firm or a Government Institution. Click the FACEBOOK ICON below To get Alerts of All Job Notifications from WAY2TNPSC Interested and Eligible Candidates can apply before 28-Oct-18. Keep on reading this page to know all the above details. So, it will be helpful to know the procedure and details for the candidates who wish to apply for this particular vacancies. 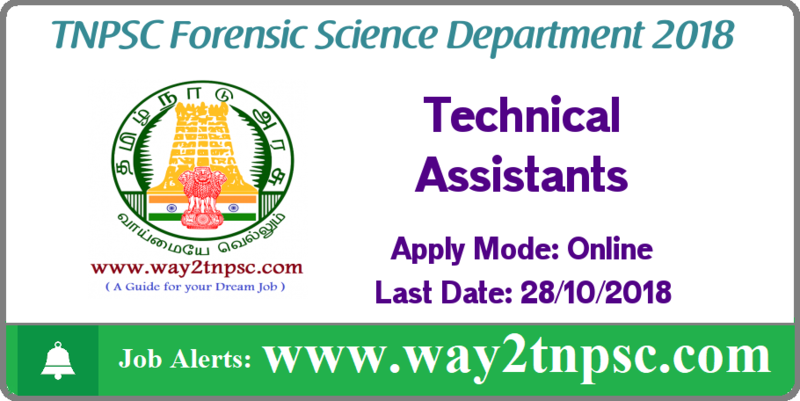 The above Notification ( TNPSC Recruitment 2018 for Technical Assistants in TN Forensic Science Department | Apply online ) briefly describes about the details of latest announcement or notification includes important dates like release date , last date of application submission, details regarding fees, exam timings. Candidates, check all the needs and apply accordingly.